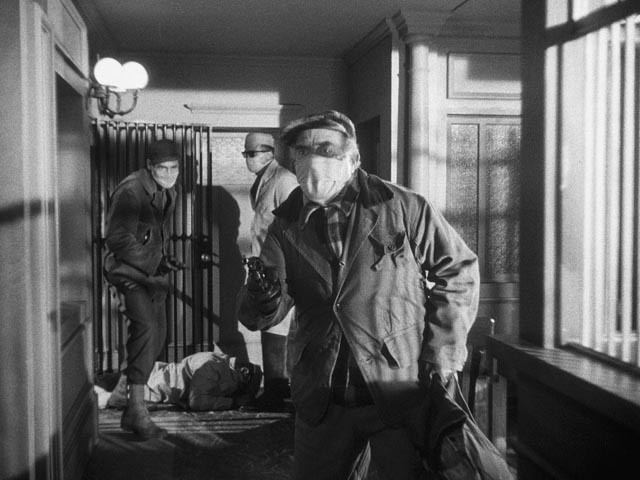 Directed and produced by Robert Wise. A disgraced former police officer (Ed Begley) sees a way out of the dead end he finds himself in: an easy heist from a small-town bank that could net $200,000. For the job, he requires only two other men. He hires a black man (Harry Belafonte) and a white man (Robert Ryan), but the former resents whites and the latter hates blacks. The trio may walk away rich, if they can keep from killing each other. This is one of those films in which you know things aren’t going to go even close to the plan, though there is no clue as to how it will really turn out. The set-up is good; there is suspense as the three arrange the robbery. A number of incidents occur that could disrupt the scheme. Of course, the biggest potential disaster is the dislike Ryan and Belafonte feel for each other. That is the basis of the plot, and the problem. Begley’s character spent thirty years on the police force; surely he could have found a less explosive pair to work with than these two. True, he chooses them for their needs: Ryan is going nowhere fast, a former convict with no prospects. 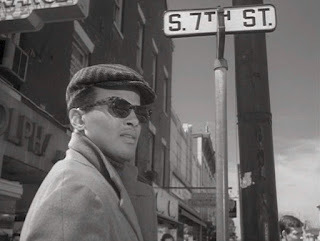 Belafonte is a gambler who is deep in debt. But out of all the criminals Begley met in his career, there must have been two who could have worked well together, been reliable, brought much less drama to the heist. Such a team would have deprived the story of its point, but would have seemed less contrived. 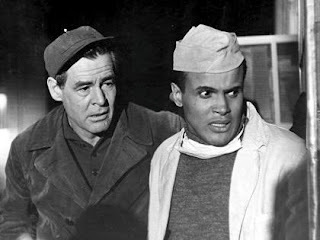 Race relations, and the consequences of not co-operating, drives the plot, but in fact nothing really develops between Belafonte and Ryan. The characters don’t learn anything or grow. I am not one who demands such progress in movie characters, but since so much of the film deals with their problems and backgrounds – that these are three dimensional men is to the writing’s credit – I expected more of a pay-out at the end. The climax is suspenseful; the conclusion is disappointing. The acting is fine. 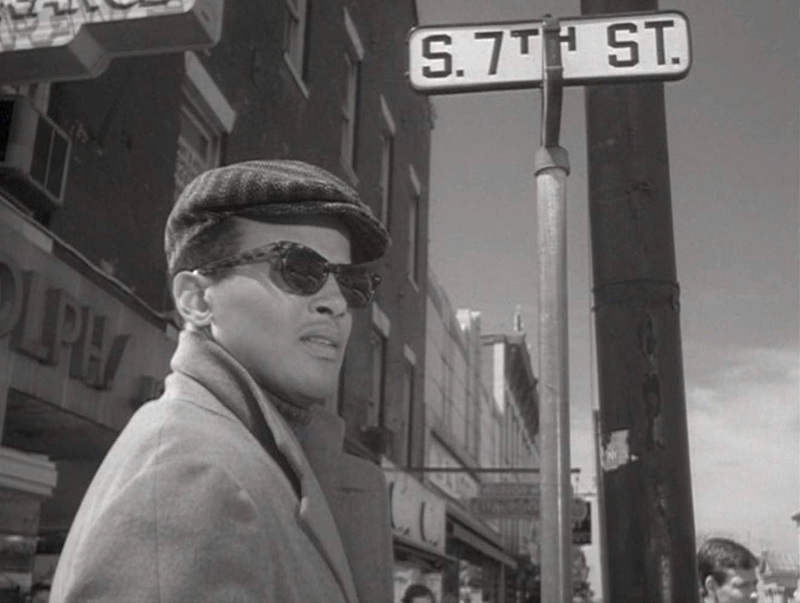 Belafonte is very good as a man who pins all his hopes (which aren’t much) on this one adventure. He orbits his ex-wife and their child, hoping to land in their lives once more. Ryan is a violent, angry man, though we’ve seen him play that sort before (eg. 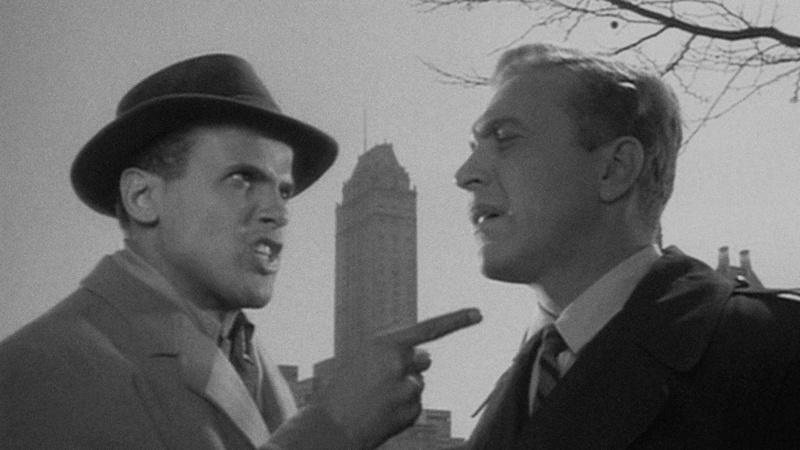 On Dangerous Ground, in which Begley was his co-star), and he’s portrayed a bigot previously, too (eg. 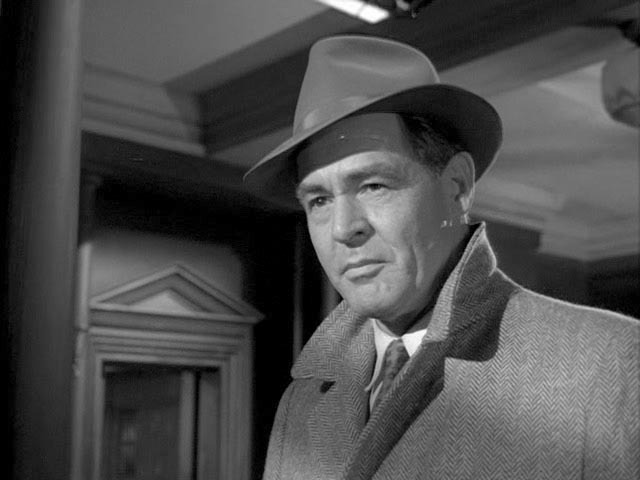 Crossfire, in which he acted with Gloria Grahame, also in Odds Against Tomorrow). Ryan is fully convincing in everything he does. 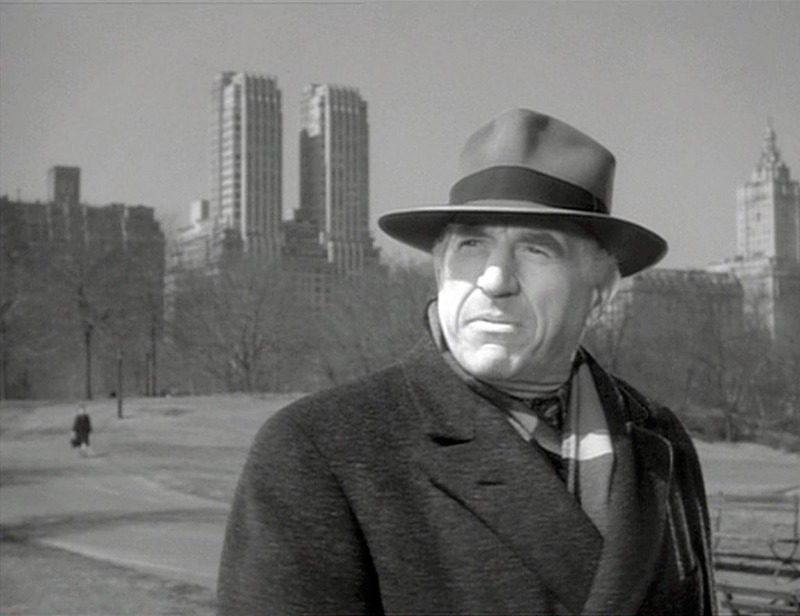 Begley is probably the most sympathetic character, embittered by his past; his crime was ‘not talking’, probably referring to refusing to give up corrupt colleagues in the police, and so has a kind of honour. The supporting cast (including an uncredited Wayne Rogers in a small part) are all good. 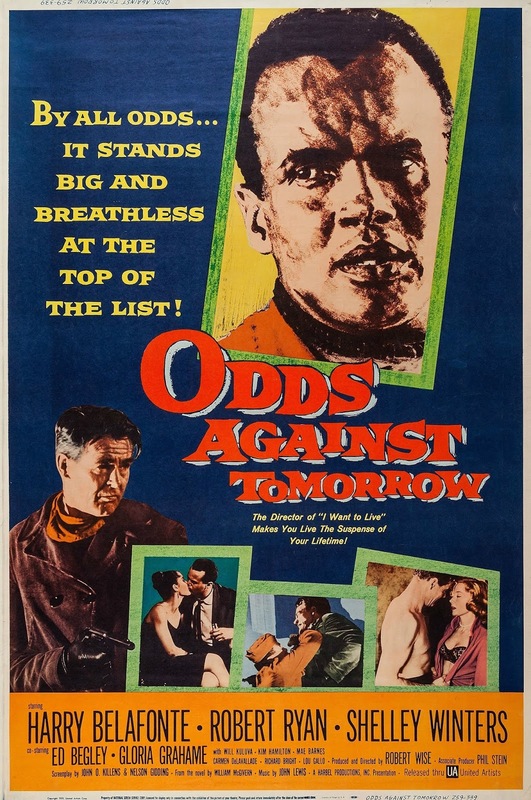 The bleakness of the race issue as shown in Odds Against Tomorrow is certainly valid. But as drama, it leaves something, literally, to be desired. Compare it to, for instance, The Defiant Ones, from the year previous, or In the Heat of the Night, and it comes across as unfinished, or perhaps unrefined. Maybe it was meant to be as rough as its characters; that should apply to the story, though, and not the movie. 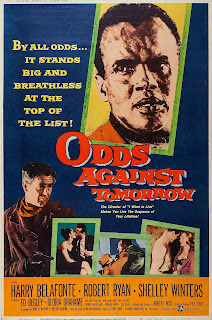 While there is much to recommend it, Odds Against Tomorrow seems to be missing something, and it is that which leaves the viewer unsatisfied at its end. I found one curious footnote: apparently the film's score was a bigger success than the movie itself! That's interesting, because right at the start, when I heard the music, I thought this movie had promise, as it sounded tense, on edge.